SinusMax Superior engineering Developed for professional duty, the Phoenix range of inverters is suitable for the widest range of applications. The design criteria have been to produce a true sine wave inverter with optimized efficiency but without compromise in performance. Employing hybrid HF technology, the result is a top quality product with compact dimensions, light in weight and capable of supplying power, problem-free, to any load. Extra start-up power A unique feature of the SinusMax technology is very high start-up power. Conventional high frequency technology does not offer such extreme performance. 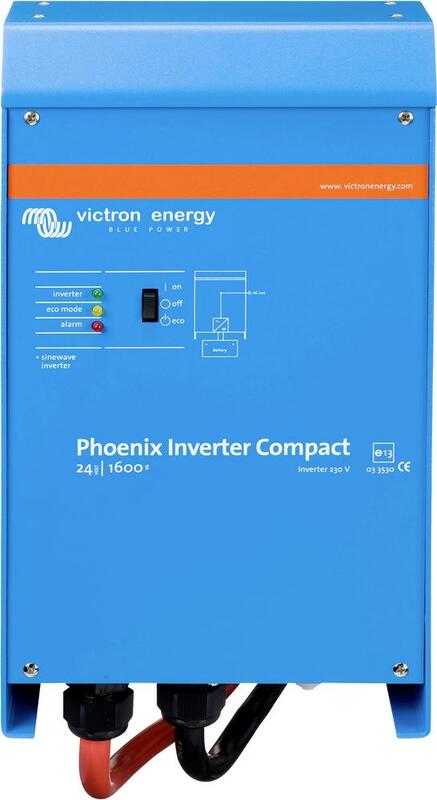 Phoenix Inverters, however, are well suited to power up difficult loads such as refrigeration compressors, electric motors and similar appliances.. Virtually unlimited power thanks to parallel and 3-phase operation capabilityUp to 6 units inverters can operate in parallel to achieve higher power output. Six 24/5000 units, for example, will provide 24kW / 30kVA output power. Operation in 3-phase configuration is also possible. To transfer the load to another AC source The automatic transfer switchIf an automatic transfer switch is required we recommend using the MultiPlus inverter/charger instead. The switch is included in these products and the charger function of the MultiPlus can be disabled. Computers and other electronic equipment will continue to operate without disruption because the MultiPlus features a very short switchover time (less than 20 milliseconds). LED diagnosis Please see manual for a description. Computer interface All models have a RS-485 port. All you need to connect to your PC is our MK2 interface (see under accessories). This interface takes care of galvanic isolation between the inverter and the computer, and converts from RS-485 to RS-232. A RS-232 to USB conversion cable is also available. Together with our VEConfigure software, which can be downloaded free of charge from our website, all parameters of the inverters can be customized. This includes output voltage and frequency, over and under voltage settings and programming the relay. This relay can for example be used to signal several alarm conditions, or to start a generator. The inverters can also be connected to VENet, the new power control network of Victron Energy, or to other computerized monitoring and control systems.